Buick has a special place in automotive history. It not only produced its share of unique and special cars but manufactured many pedestrian cars that served as reliable transportation for many American families. However when reliability tends to be the first and only word to describe an auto brand, it then becomes a massive albatross around the neck for the overall appeal of that automaker’s cars. Put another way how many sports stars, Hollywood celebrities, or elite would be caught driving a new Buick in 2015? Not many – this isn’t a poke at Buick but its middle class roots have evolved (or taken a wrong turn) over the years into a brand for the older segment of the senior citizen community. And this move in the wrong direction has been occurring over the last 30 years. Buick to its credit finally realizes this is a problem, and is currently attempting to spice up its offerings. Rewind back to the 1950s, and the Buick Roadmaster was one of the hottest cars to own in America. By the 1960s Buick offered the sporty Riviera, and later the Regal based GS, and Toronado. The good stuff continued into the 1980s then Buick took a turn towards stodgy plain Jane front-wheel drive offerings. When GM pulled the plug on Pontiac in 2008 which outsold at the time Buick by a 3 to 1 ratio, most thought GM had made the wrong decision. The only reason why GM saved Buick instead of Pontiac was Buick was popular in China and GM figured future potential of increased sales in China were worth keeping the brand alive. It proved to be a wise move since Buick hit over 1 million global sales for 2014 – its best sales year ever. Though sales were still weak in the U.S. for 2014 with 205,509 units, China sales were hot with 809,918 units for the same year. The Buick Roadmaster was one of the most elegant and beautiful new cars on the road back in 1950s. It was long and wide and a status symbol that showed all that the owner had obtained financial success. 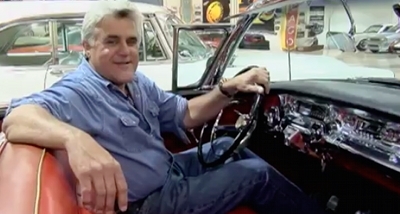 The Roadmaster struck a chord in Jay Leno’s automotive heart when he was young, and the love of the Buick Roadmaster led to his first purchase of a 1955 Roadmaster in 1973 before his career in the entertainment industry took off. He still owns that same Roadmaster today. Though the car has been restored twice, Leno added some extra grunt under the hood in the form of a 620 horsepower high-performance Chevrolet big-block 572 CID V8. In the spirit of originality, his 1957 Roadmaster convertible will garner the attention for this article. His 1957 Roadmaster is an original non-restored car in very good condition. The original exterior paint is almost 60 years old. There’s absolutely no deviation from stock. Even the original 364 CID Nailhead V8 still produces the stock 300 gross horsepower. The 1957 Roadmaster was truly a work of art with enough exterior and interior chrome to put a block of parked Harley Davidson motorcycles to shame. The panoramic view of the front windshield gave occupants no forward or side blind spots. And the standard dual exhaust exited out the rear bumper with each exhaust tip on opposing sides of the bumper. Even the famous Buick portals were visible on each of the front quarter panels. The interior was what the economically well-to-do demanded of a luxury car back in the day. The 1957 Roadmaster is from an era when Detroit was the envy of the world, and everyone wanted a long and wide classy car with a powerful V8 to navigate the paved streets. The 1957 Roadmaster had it all including the ultra smooth Dynaflow automatic transmission which may have only had two forward gears but it still rivals in glassy smooth shifting even the best of the modern automatic transmissions. Leno has owned his 1957 Roadmaster for a little over a decade, it’s a sure thing he will own it for many more years to come. I don’t know about you, but when I think about Leonard Nimoy who recently passed away, I think of Mercedes Benz. Maybe it was the type of intellectual roles with in which he seemed to play so well. Or maybe it was the Audi TV commercial where he drove a late-model Mercedes while singing a Bilbo Baggins song or perhaps his very memorable role in TV’s Columbo where he played a shrewd and witty Mercedes driving medical doctor. 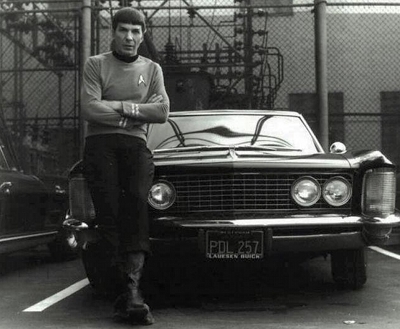 Nevertheless whichever way you want to look it, there’s no doubt Nimoy liked luxury cars. And it’s his sporty and luxurious 1964 Buick Riviera, that will forever be associated to him. 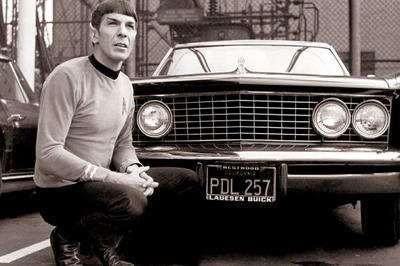 It all started back in 1966 while Nimoy was on the Desilu Studios backlot in Culver City, California for the filming of the original Star Trek series – a few photos were taken of him posing in front of his Riviera. He was in full dress and makeup of his infamous character Mr Spock. It seemed more of a perfect fit than you think, with the Riviera’s flashy and space age styling Mr Spock didn’t look out of place posing next to the Riviera (a bit of interesting trivia, the 1963 Corvette fastback to Nimoy’s right in the both pictures belongs to Captain Kirk). Another interesting tidbit in the pictures is the "Lauesen Buick" on the front license plate frame. Lauesen was a Buick dealership in the Westwood section of Los Angeles not more than a stone’s throw from the Culver City studio. Lauesen sold many Buicks to Hollywood celebrities before shutting its doors. The sleek and performance oriented Riviera was first introduced in 1963, it was a car that looked 10 years ahead of its time. It also was the perfect blend of performance and luxury. Nimoy was not yet a household name when he first purchased the Riviera however driving the Riviera showed those big wigs around Los Angeles that Nimoy was someone on the rise in Hollywood. What’s not known is which version of Buick’s hot 425 CID V8 Nimoy’s Riviera was equipped with – the standard 340 gross horsepower 4-bbl equipped V8 or the optional 360 gross horsepower dual Carter 4-bbl V8. 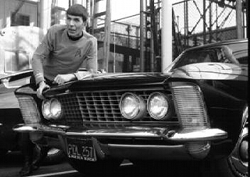 Either way, Nimoy had enough juice under the hood to move the Riviera faster than the Starship Enterprise. And after a tough day at the studio set, Nimoy probably looked forward to the ride home in the plush comfortable expansive interior. It’s no coincidence that as the Riviera faded in appeal by the mid-1980s so did Buick. Fortunately there’s enough of the classic Buicks still around to keep Buick’s legacy alive. Hopefully Nimoy’s Riviera is still around cruising the streets or in someone’s private car collection. Forget about what you think you know about David Spade, or any misconceptions about him which are fueled by the usually inept and clueless characters he plays so well on the big screen. 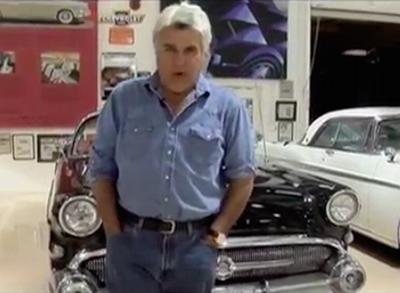 Spade knows his cars, and his choice of one of the most revered American muscle cars is proof positive of this fact. What’s ironic is his characters’ fondness for 426 Hemi V8 powered muscle cars in the Tommy Boy and Joe Dirt movies, yet his fondness for the mighty Buick turbo V6. The 1980s decade started out on a weak (horsepower) note and ended on a high one. During the 1980s, Buick’s lowly turbo 3.8 liter V6 motor grew from mediocrity to greatness. By 1986, the turbo SFI 3.8 liter V6 powered Buick Grand National (GN) was the fastest accelerating new American car, even faster than the 1986 Chevrolet Corvette. And for 1987 the GN was again faster than the 1987 Corvette. Buick had showed the world in the 1980s that it could make one of the fastest accelerating cars in the world with the 1986 and 1987 GN – both of which was capable of high-13 second 1/4 mile times. This type of performance compared to today’s high horsepower performance cars is still impressive. The official net horsepower rating was 245 – a figure ridiculously underrated by Buick, the real world net horsepower rating was close to 300. The good stuff would have continued for Buick had it not been for GM canceling the very popular rear-wheel drive G-body platform that the GN used. A shortsighted strategy that left Buick in 1988 without a rear-wheel drive car for its turbo SFI 3.8 V6 which officially marked the end of Buick performance. This is why Spade’s GN is so special, it’s the last of the high-performance Buicks. And like every other 1987 GN, Spade’s GN has an entirely black exterior with a gray cloth interior. It has comfortable front bucket seats and can fit five adults comfortably and devour lots of luggage in the massive trunk. It’s the perfect performance car for commuting especially since it has the mandatory stock computer controlled 4-speed automatic transmission with overdrive which can cruise the LA freeways at higher speeds while still maintaining low RPMs. This allowed the GN to obtain a very impressive 25 MPG during highway driving. The GN is old enough to have the body-on-frame structure which most of the traditional muscle cars had yet it has modern era items such as a reliable turbo, sequential fuel injection, and the just mentioned 4-speed automatic transmission. It’s the best of both worlds which is probably the reason why Spade has been spotted driving the GN on a regular basis around the LA area. Say what you will about Spade, the guy knows his performance cars and he couldn’t have picked a better car to drive around town than the GN. His Hollywood counterparts may be driving Bentleys, Ferraris, and other very expensive exotic cars but his GN gets just as much attention as those over priced status pieces.